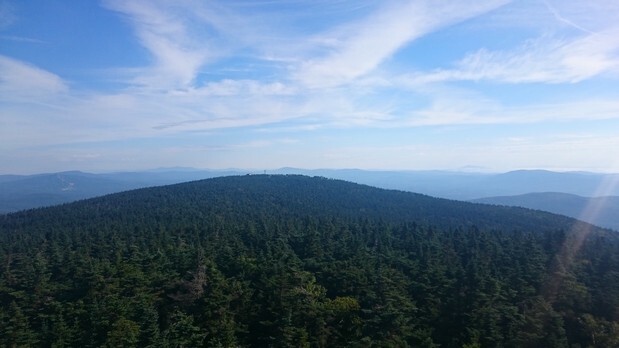 Every year, thousands of hikers attempt to thru-hike the 2,190 miles of the Appalachian Trail (A.T.); yet only one in four makes it the entire way. We had the pleasure of conducting a Q&A with Jeff, a.k.a. Toes, who recently completed this adventure. He shares with us his experience and the role that Honey Stinger played along the way. What prompted you to hike the AT? I was about 12 years old when I saw a sign along the road for the Appalachian Trail. Someone explained to me that there was a hiking trail that went from Georgia to Maine, and I was hooked. I knew someday I would make that journey. 25 years later, I was spending some time traveling in Brazil. After a pleasant day of hiking, I was watching the sun set over the hills and I thought to myself, “I need more of this in my life.” The next year I was on the trail. What were some key moments? Leaving the Smokies, coming out onto the first bald (Snowbird) on a beautiful day, and just sitting in the grass enjoying life. That was about 3 weeks on the trail for me. It was the first time that I stopped, just to enjoy where I was. Until I got to Maine, that moment on Snowbird was the best part of my hike. But the beauty and peacefulness of Maine can hardly be described in words. In Maine I would hike for hours and not hear the faintest sound of human civilization. I found that often the birds were respectful in keeping silent as well. How did you come to find out about Honey Stinger? While at Trail Days in Damascus I met a rep from Big Agnes [Honey Stinger’s sister company] who had some extra Honey Stinger waffles at the end of the day. Up to that point I had been hesitant to buy many energy snacks that I never tried before due to the cost/risk of not liking them. But the moment I tried the Honey Waffle from Honey Stinger (which reminded so much of the delicious Dutch stroopwafel), I knew I had been missing out. Do you have a favorite product and flavor? The Honey Waffle and Vanilla Waffle are probably my favorite, but I like them so much I had a tendency to hoard them so long that they lasted through multiple resupplies before I gave in and ate them. The Organic Energy Chews (Pink Lemonade, Fruit Smoothie, Orange Blossom) are my go-to favorite chew flavors. Once I started trying all the different energy snacks on the market, I found that the Honey Stinger chews are hands down the best. What were your fueling strategies? One of my strategies for big miles was to make sure to consume about 100 calories per hour. Equally important was to have a good snack just before a big climb. Some Organic Energy Chews were my favorite choice, and I’d make sure to have a pack ready in my hip belt before leaving camp in the morning. Did you see Honey Stinger products on the trail with other hikers? One of the things you learn early on when hiking is that your food is going to get smooshed. So when I first started buying the Organic Waffles I made sure to eat them the same day so they wouldn’t get crumbled and messy. I was hiking with another guy through the Shenandoah’s, and a few days into the park, he pulled out an Organic Waffle from his hip belt. I was shocked and asked him how he managed to keep it from getting crushed into a pile of crumbs. He informed me that he didn’t do anything special and that the waffles hold up well on their own. How right he was. What did you learn from your time on the trail? I’m highly adaptable. About halfway through my hike, I took a couple side trips to big cities (Chicago, and New York). Going from spending lots of time alone in the wilderness to taking subway trains packed with people made no difference to me. If it wasn’t for other people pointing out the peculiarity of it, I might not have even noticed at all. Any other anecdotes you would like to share? The “Half-Gallon Challenge” was an enjoyable experience. It was challenging to do it on a cold rainy day, soaking wet, and in under 20 minutes; but I still love ice cream as much as I did before, if not more so. 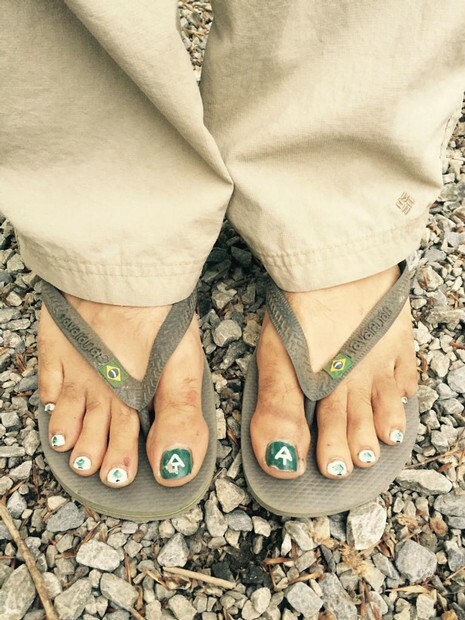 To read more about “Toes” and his Appalachian Trail journey, visit his trail journal at http://www.trailjournals.com/toes . 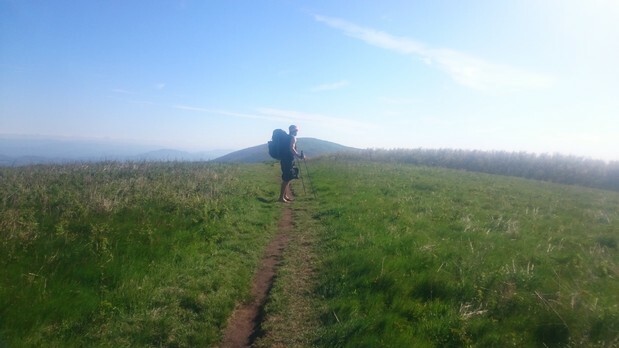 This entry was posted in Hive News and tagged Appalachian Trail, AT trail, Half Gallon Challenge, honey waffle, organic energy chews, Smokies, thru-hike, Trail Days, trail journal, vanilla waffle. Bookmark the permalink.